BTS in Dortmund always has a varied selection of young used DAF vehicles and brand new trucks on stock. We aim to have all the different types of DAF trucks available to you. If we do not have the right vehicle in stock for you we can always order a new DAF with your specifications or locate a young used truck through our purchase network. Being the largest DAF dealer in Germany we always have a range of brand new vehicles on stock, for our local customers. 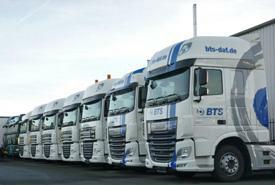 We can order these vehicles as a result of our close relationship with DAF. This helps if you require a new truck, but do not have the time to wait.